I swear this is the last time. If weather or animals take out this birdbath again, I'm giving up. 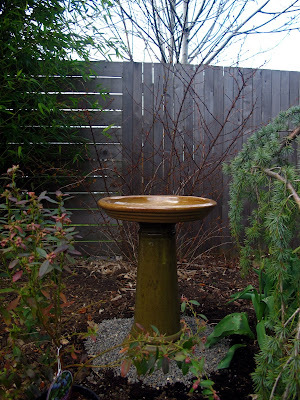 This is the $5 birdbath that lost its top after a cat or a raccoon knocked it over and broke it. It had already been broken and glued together once before. I bought a saucer from Lowe's and glued it to the base with Liquid Nails. I swear if it gets broken again, I'm going to break up with bird baths. Me and watching birds on Saturday mornings in bed, with the curtains open and coffee in hand . . . oh, who am I kidding? I'll probably replace it again. Bird bathing is so adorable! I was gonna say the same thing...a piece of rebar would at least keep it upright...unless it's a REALLY big raccoon, or a velociraptor. You can't give up on bird baths. Worst case, you can buy a plastic or metal bath. Inverted trash can lids make good bird baths.